The very finest acapella vocal music for the St. Louis Metro Area. We love to sing four part harmony! 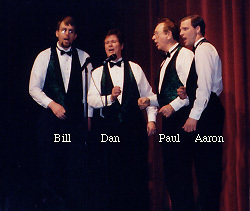 Back in 1985 various members of The St. Louis #1 Chapter Chorus got together to sing as a quartet. We decided to form The Rivertown Sound Quartet - inspired by the great variety of music from our hometown, St. Louis, Missouri. 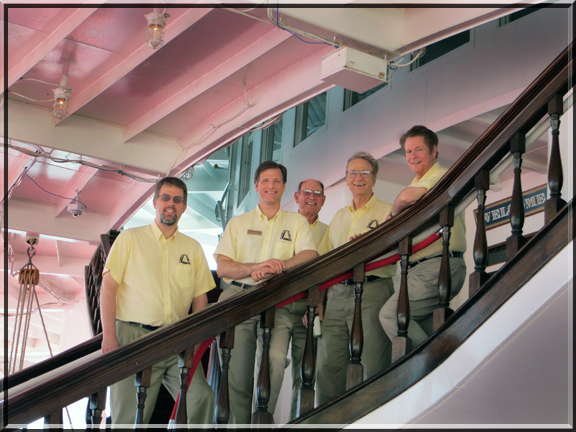 As faithful members of the Barbershop Harmony Society (SPEBSQSA), we are dedicated to preserving good singing and four part harmony. However, while we continue to sing traditional songs from the "turn of the century", more and more audiences have asked us to perform songs from the 1950 's and 1960's. As a result, we have become St. Louis' premiere "Doo Wop Quartet" and are honored to hold that position. We usually sing without a band - just four voices making the music. When we do sing with a band, it's the great Mid South Revival Band of Steve Davis. See below for more on Steve and the Band. We feel The Rivertown Sound has developed into a unique singing ensemble. Click HERE for biographies on all Rivertown Sound members past and present. If you would like to see a PRINTED PROGRAM of our standard 30 minute show, click HERE! • Click HERE to listen to an mp3 file of "Barbara Ann" with Aaron Hardin as lead singer. It will take a while to download, but it's the whole song. Size is 1.8 MB. • Click HERE to listen to an mp3 file of “Earth Angel” with Dan Monahan as lead singer. It is also the entire song. Size is 2.1 MB. 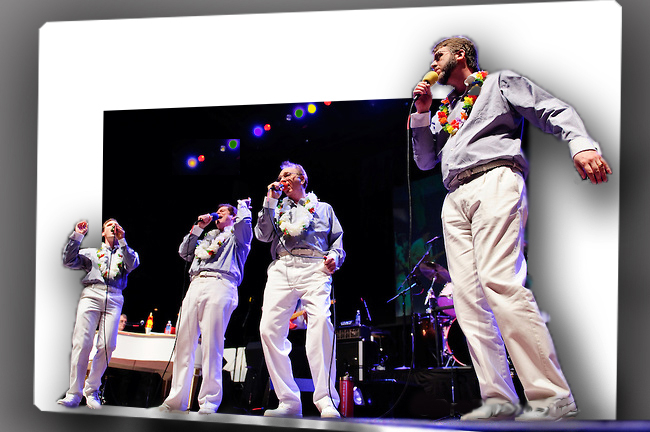 If you would like to see a CD of our Doo Wop Songs, click HERE! 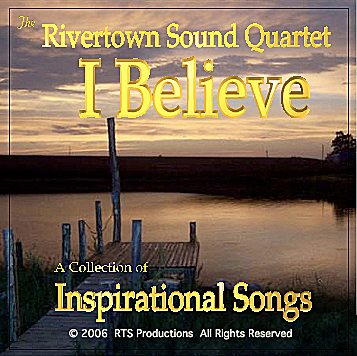 If you would like to see a CD of our : I Believe, a Collection of Inspirational Songs, click HERE. 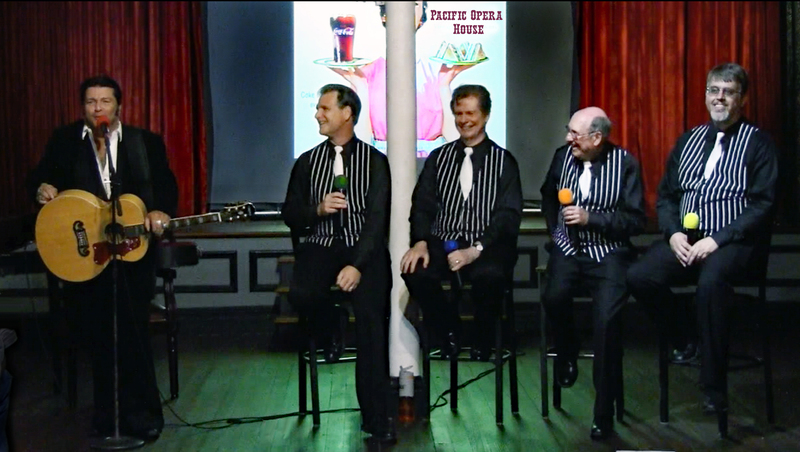 If you would like to see a CD of our : Barbershop Quartet Classic Songs, 1896 - 1912, click HERE. HEADLINE NEWS ABOUT THE QUARTET! 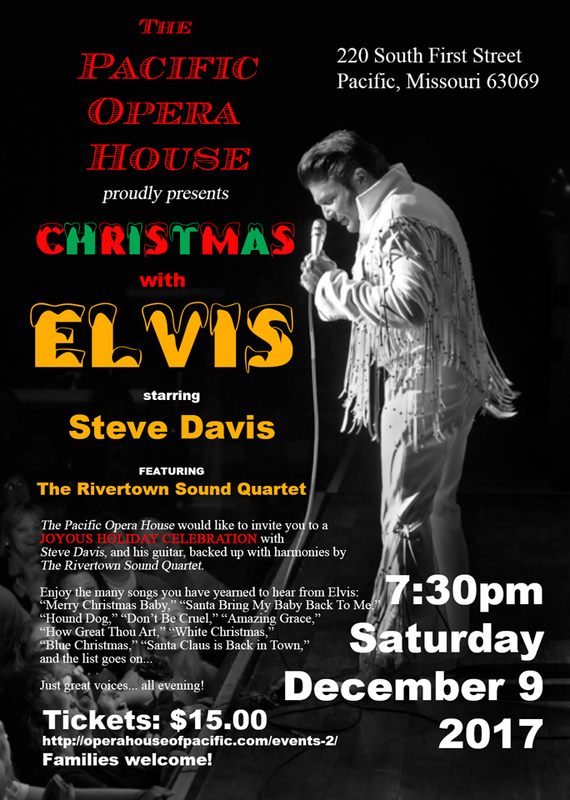 December 9, 2017: Pacific Opera House presented "An Elvis Christmas Show!" The Pacific Opera House hosted our second performance with Elvis. This time it was a wonderful Christmas Show! 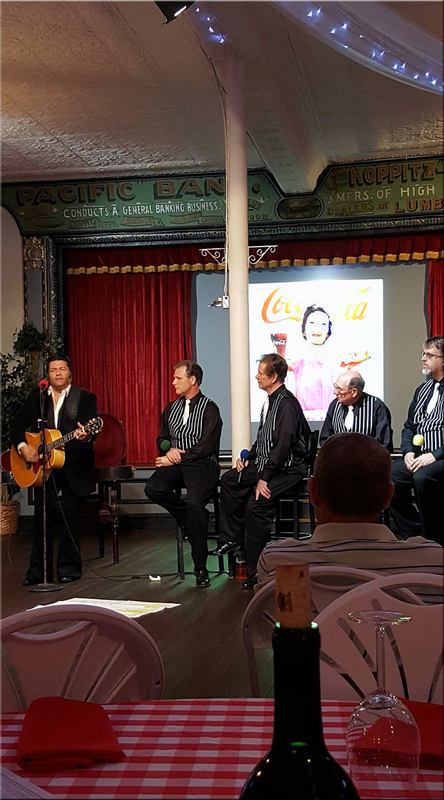 It was an all-acoustic perfornance by Steve Davis as Elvis, with his guitar, backed up with harmonies by The Rivertown Sound Quartet. It was a full evening of Christmas favorites - as well as other classic hits like "Hound Dog," "Heartbreak Hotel," and "All Shook Up." This was the fifth time the quartet performed at the Opera House. The folks are always so nice there, and the audience is so kind. The quartet sang the best of their Christmas song repetoire as an opening to the Elvis part of the show. We are sure the audienc enjoyed actual Christmas songs sung so beautifully. Then in ACT II, we joined Elvis on his Christmas classics like "Blue Christmas," "Santa Claus Is Back In Town," and we even had an old fashioned "sing a-long" with Audrey Monahan, Joanne Black McHugh, with Jim McHugh at the piano. This was a unique show! 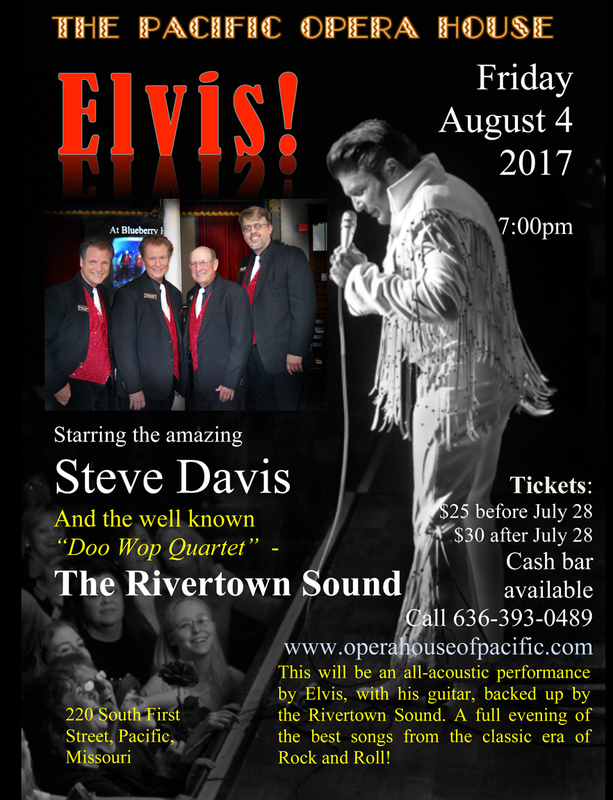 August 4, 2017: Pacific Opera House presented "Elvis!" 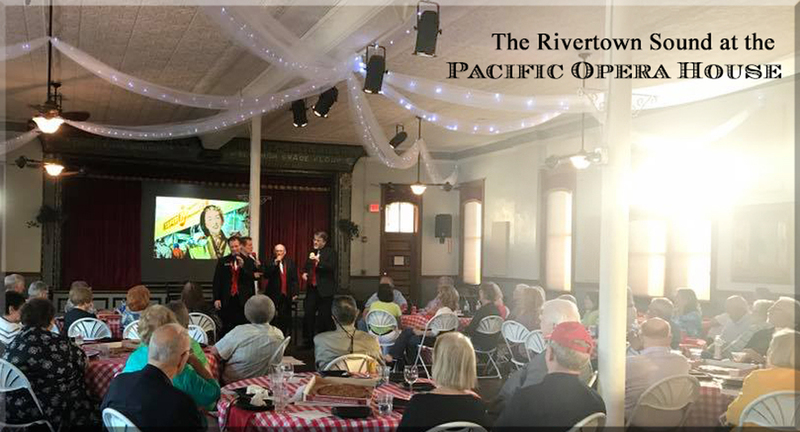 After the success of the June 30th show, The Pacific Opera House presented The Rivertown Sound Quartet once again. This time Elvis Presley himself joined us. Our dear friend Steve Davis brought his guitar and sang with us for an entire acoustic evening of the very best of the King's music. This show was unique in that Elvis' band did not join us. It was just great voices, accompanied by one guitar. That was unique and fun. June 30, 2017: Pacific Opera House "Lost In The 50's Show"
What a hit! 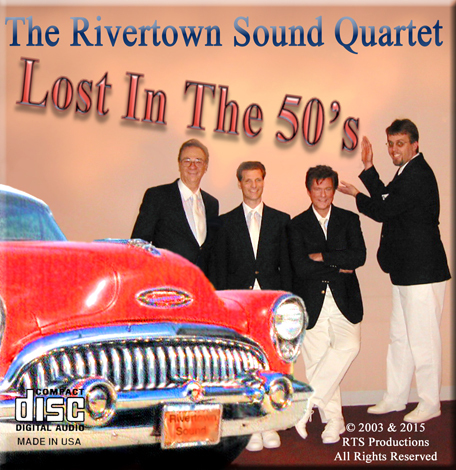 The Rivertown Sound presented a "Lost In The 50's" all acapella performance in the famed "Opera House" of Pacific Missouri. [220 South 1st Street, Pacific, MO.] This special show in the century old vaudeville theater featured the quartet for a full two act performance! The goal of the evening was to recreate some of the fun of just hanging out with friends in the 50's and 60's. Two hours of the best of Doo Wop era songs. The Coke and pizza were free. There was a cash bar too. Fun was had by all. • Check back here for more shows at the Pacific Opera House. It certainly seems like a long time ago now. It was on Saturday, December 19, 1998, that the quartet gave it's first performance with the Las Vegas style stage show of Steve Davis. 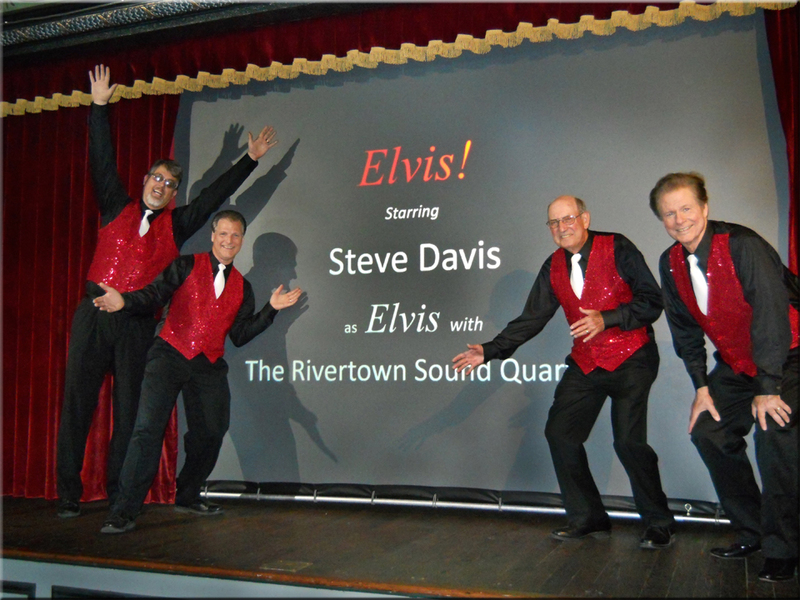 Steve's amazing bass - baritone voice recreates the songs of Elvis Presley better than anyone we have ever seen. From the moving ballads like "Love Me Tender" to the rousing "Jailhouse Rock", he electrifies the theater with his genuine stage charisma. 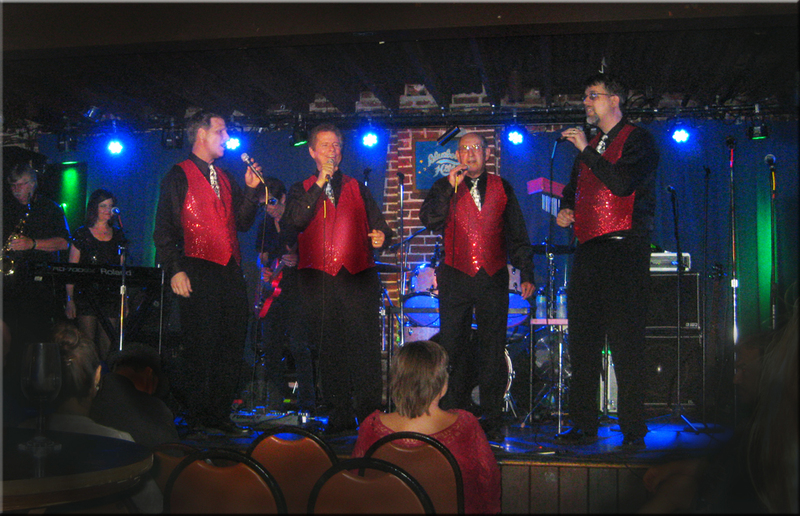 As would become a regular feature, the quartet opened the evening with our fifteen minute show of 1950 's Doo Wop songs. On the last song, "Blue Moon", the band joined us with strong accompaniment. Singing with the Band is always quite exciting because we usually sing without instrumental accompaniment. Our act is a good transition to "Elvis" coming on stage. We then provide backup for dozens of Steve Davis' Elvis songs like "Teddy Bear", "Don't Be Cruel", "Hound Dog", and the always dramatic "American Trilogy". During the rehearsals and many performances, we have become life long friends with the extremely talented band members, their families, the fan club, and of course Steve himself. After the show, we have the opportunity to spend time talking with the many fans of Steve Davis. We have learned that the some 300 members in the Steve Davis Fan Club were just as warm hearted and kind as Steve and the band. Needless to say, we look forward to performing with "Memories of Elvis" for many more years. Check in here for the latest updates on the shows. 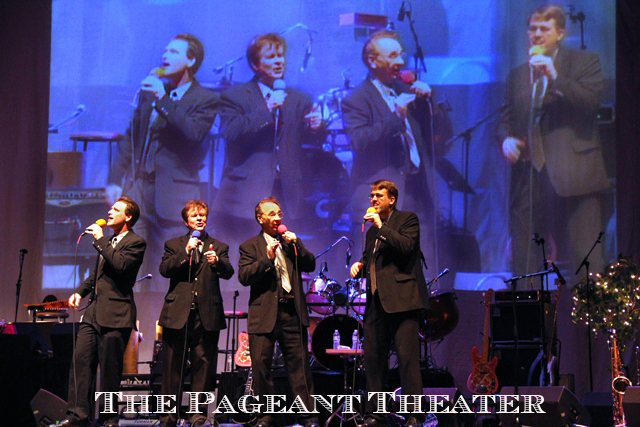 We have been honored to have performed 18 shows with Steve Davis at the nationally famous Pageant Theater in University City (St. Louis) Missouri. Over a thousand fans attended this special event. Joe Edwards, founder of the Pageant Theater as well as Blueberry Hill, has always been supportive of Elvis, the band, and all of the performers. Our friends at "Just Wooden Fences" asked us to perform a "commercial" on this special show. It was produced live at the famous Sheldon Concert Hall in St. Louis. We sang "Little St. Nick" with a line publicizing the "Just Wooden Fences" company. The entire hour and a half show was total fun, and we look forward to appearing again in the future. 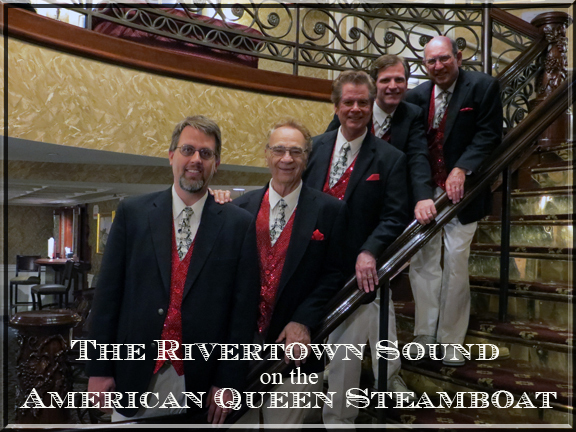 During the summers of 2013 and 2014, The Rivertown Sound performed on each of the cruises that came through St. Louis. We would join for one to four days as the boat cruised toward St. Paul, or heading the other way from St. Louis to the South. Depending on the number of passengers, we performed two "official" shows each cruise. One was mostly old barbershop songs and the other was all Doo Wop songs. We sang river songs like "Down by the Riverside," "Row, Row, Row" and "Old Man River." In fact, we sang "Old Man River" about a half dozen times on each of the cruises. We also sang some old gospel, patriotic and - of course - "Doo Wop" 1950's hits that have gained such wonderful recognition for our quartet. Both Vern and Paul were able to join us, so we had five singers for the Rock and Roll songs. It was fun! 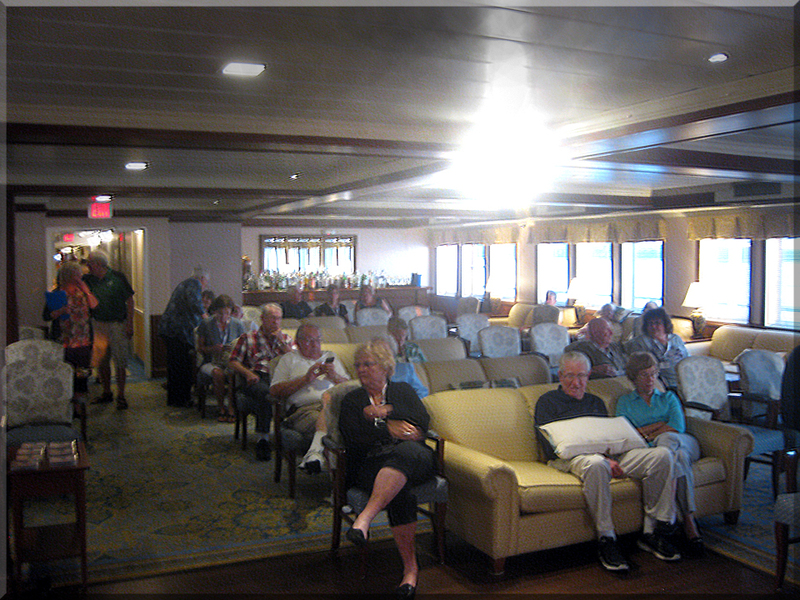 The rest of the cruise, we were able to enjoy the company of the other passengers and sing their favorite songs in a more informal way. 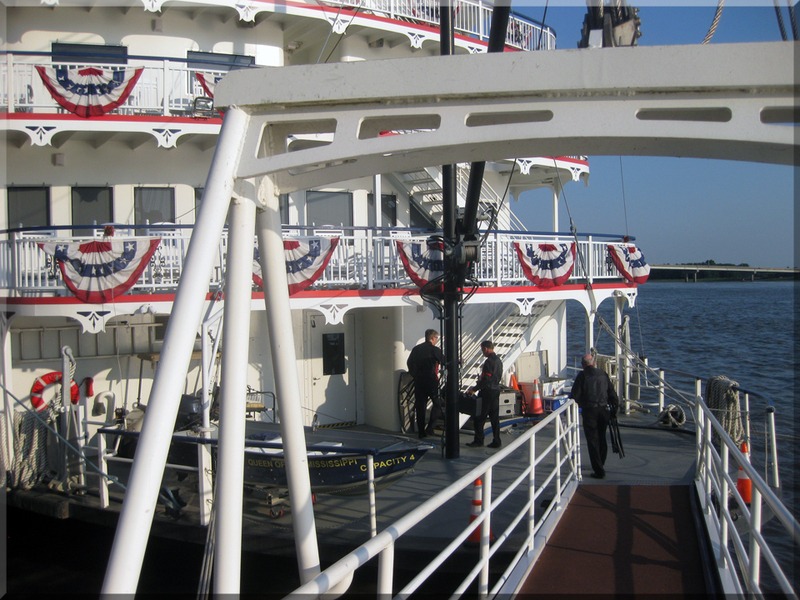 Much to our regret, we were unable to cruise the American Queen again. We look forward to the opportunity to return in the future. 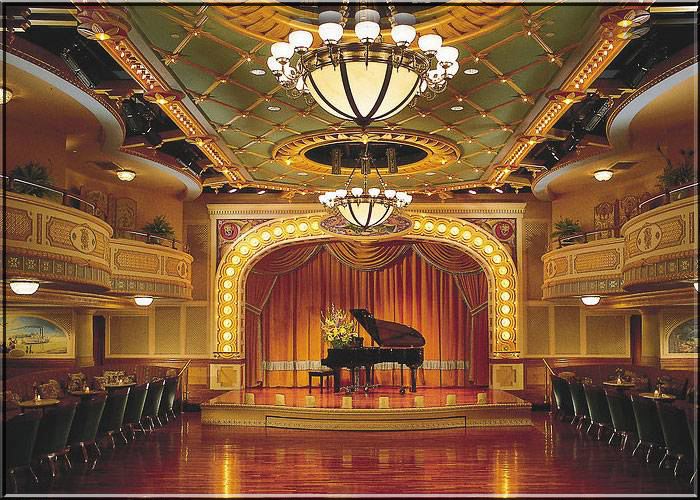 The theater is one of the most ornate and beautiful we have ever seen. The elegant staterooms, gathering areas, and dining room make a voyage on the American Queen an experience of a lifetime. 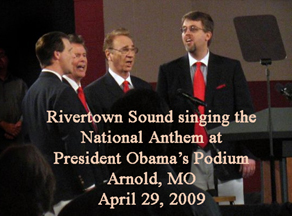 On April 29, 2009, President Obama held a town hall meeting in Arnold, Missouri. The quartet was asked to sing the "National Anthem" at the start of the event. It was quite an experience. Paul took calls from the White House setting up the details. We arrived at 7:30 in the morning and went through the Press Entrance. There were Secret Service guards everywhere as well as familiar members of the St. Louis press corp. For the next two hours we talked to the press and the members of the White House staff. It was interesting that everything was brought from Washington: the stage, lighting, sound system, the podium, etc. At about 9:45 we were brought backstage to warm up. We hoped to meet the president there, but he was in another room. At 10:00 we went on stage and began singing. Since we have done the "National Anthem" many times before, we were confident that it would go well -- and it did! During the president's speech, Missouri's governor and US Senator sat in front of us. He answered questions from the audience. Republicans and Democrats alike seem to appreciate the opportunity to directly communicate with the country's top leader. 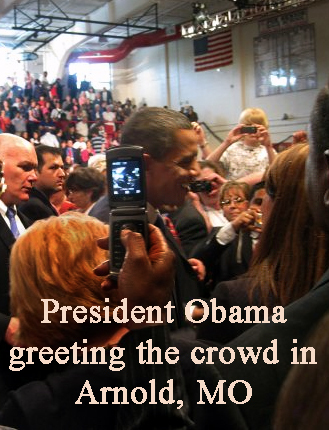 Afterwards President Obama briefly walked around the inner circle area to meet people. Our baritone, Dan Monahan, made his way from our nearby seats to the railing and shook hands with the president. Later, we met varioius Missouri political leaders who had nice comments about our rendition of the "National Anthem" . We were interviewed by the St. Louis Beacon afterwards. They made of video which included the entire song and some comments from us. Here's the audio only which is cleverly overlapped with our interview as well as a bit of Obama's speech. AUDIO of the National Anthem. Regardless of our political points of view, it was truly an event to remember. 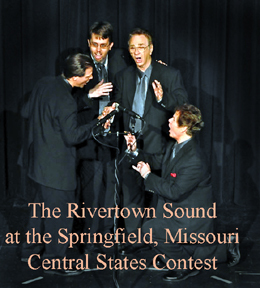 In April, 2010, Rivertown Sound competed in the "Pre-lim" contest in Peoria, Illinois. The judges liked our renditions of "Whatever Happened To The Old Songs" and "Last Night Was the End of the World" on Friday night and moved us into the Saturday night finals. The quartet then sang "Songs Like Daddy Used To Play" and "Melancholy Baby". This "Top Ten" is difficult for a performing quartet to achieve. We are very proud of this achievement. We represented our dual membership chapter in Waterloo, Illinois. These great guys encouraged us and we are very appreciative. 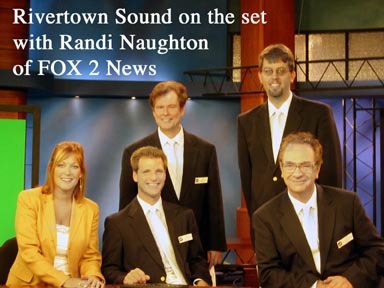 Rivertown Sound Quartet Appears on St. Louis Television "FOX 2 NEWS"
The Rivertown Sound sang on FOX2 NEWS during the Christmas season in 2014. 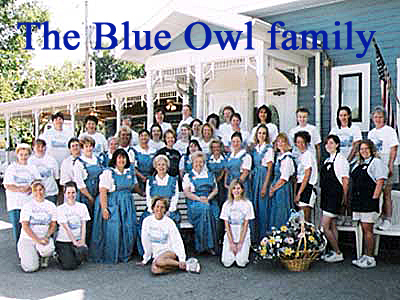 We appeared with Mary Hostetter of the Blue Owl Restaurant. She brought a huge selection of her nationally known bakery products to display - and give to all in the studio. 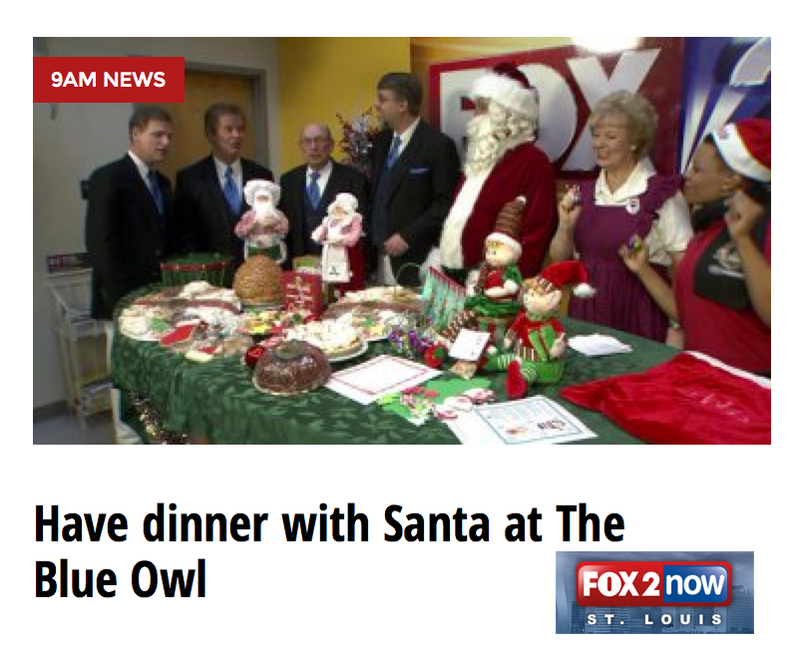 We sang "Santa Claus is Coming to Town" in that segment. 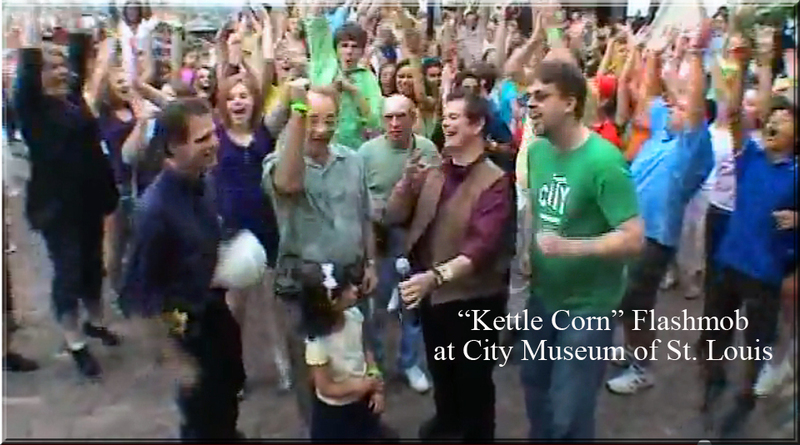 In another segment we sang "I'm Yours" as a tribute to one of the interns who was leaving the station that day. 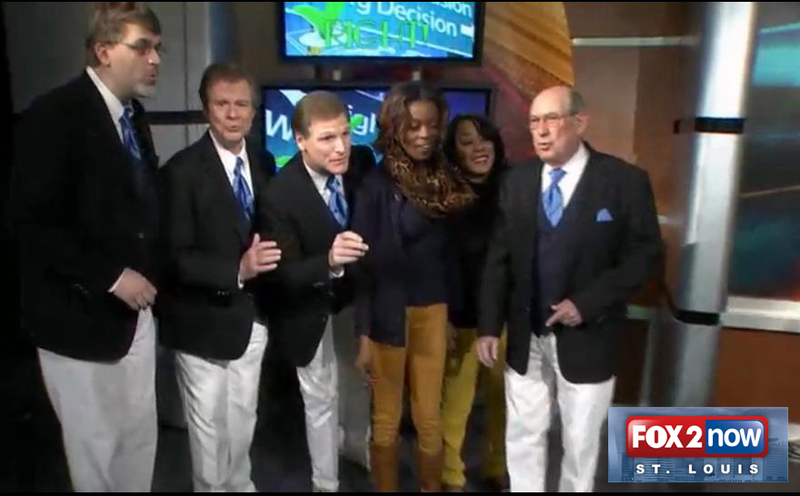 This was not the first time we have sung on FOX 2 NEWS. 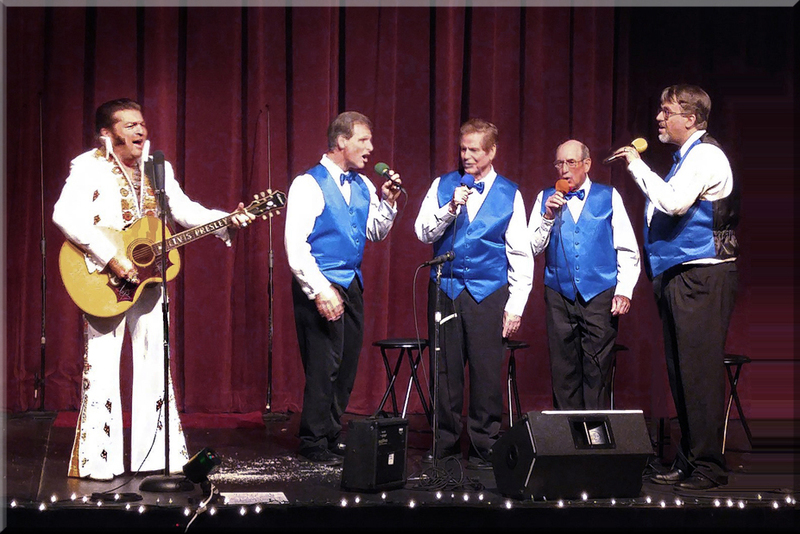 In February of 2003, Rivertown Sound sang on the Sunday morning news to help explain our "Valentine Day" song program in which a special love song is delivered by a quartet for romantic folks around town. The money collected was used to promote vocal music education in St. Louis. Another time was July 1, 2005. We sang "Lion Sleeps Tonight" on the main part of the show and and later performed "Earth Angel" during the anniversary photos near the end of the broadcast. We have no video of these previous broadcasts. 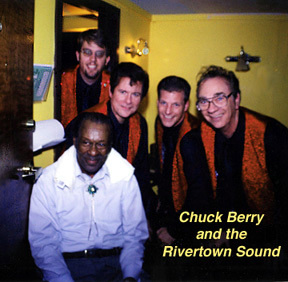 The Rivertown Sound Opened for Chuck Berry at Blueberry Hill! Chuck said, "You kids were great!" We liked the "kids" comment particularly. September 18, 2002 was perhaps our biggest show ever! 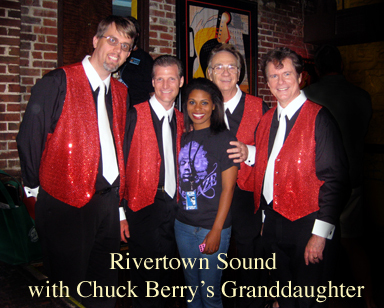 Rivertown Sound performed our full 50 minute "Doo Wop Show" to warm up the crowd for legendary Rock and Roller, Chuck Berry. All of our previous performances at Blueberry Hill had been part of Steve Davis' "Memories of Elvis" but this time we were on our own. The great TCB Band offered to back us up, but the owner of Blueberry Hill, Joe Edwards, thought that just the voices alone coming through their excellent sound system would be a unique way to capture the sound of the 50 's. Among the 18 songs we performed that night, we introduced several new songs for us: "I Get Around" by the Beach Boys, "Happy Together" by the Turtles --and of course "Blueberry Hill" by Fats Domino. 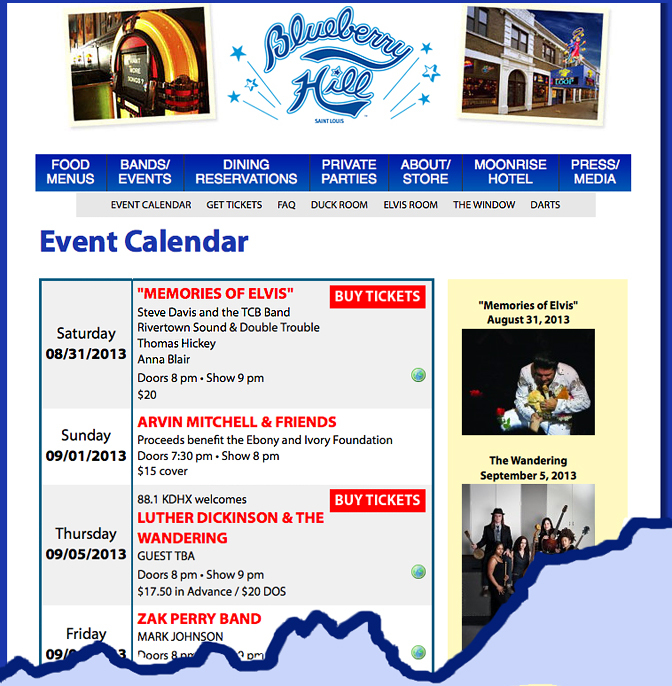 In 2008, Chuck Berry's granddaughter was at our annual show with Steve Davis at Blueberry Hill. She is a performer herself and has had a successful career. She told us that at that time her Grand Dad was doing just fine, and was still performing. In fact, he continued performing in the "Duck Room" through 2014 after illness forced him to retire. When Chuck Berry passed away in 2017, everyone associated with Blueberry Hill expressed great loss. We certainly looked back fondly on our moment in the glow of the founder of Rock and Roll. Doing Barbershop Society annual shows are always the most fun. There are some 27,000 men in the Barbershop Harmony Society centered around 800 individual chapters (choruses). We make special efforts to arrange our schedule to fit them in. We also give a special performing rate. Florissant Valley Chapter, St. Louis Suburban Chapter, Belleville Chapter; The Sweet Adelines Gateway Spotlight Chorus, The Waterloo Illinois Area Chapter; Little Egypt Barbershop Chorus, Carbondale, Il; the Columbia Missouri Chapter, the Homestead Harmonizers of Beatrice, Nebraska, and of course, our own beloved chapter in Hillsboro, MO The St. Louis #1 Chapter Chorus. We have been honored to be part of these great chapter's annual shows. 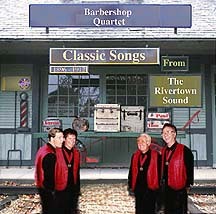 As guest quartet, the Rivertown Sound will perform barbershop classics as well as our unique hits from the 1950's which few other quartets do. . "Barbershoppers" are always fun to talk to, sing with, and celebrate together our hobby. 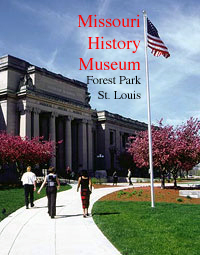 Yes, it's been over 100 years since the great St. Louis World's Fair in Forest Park. 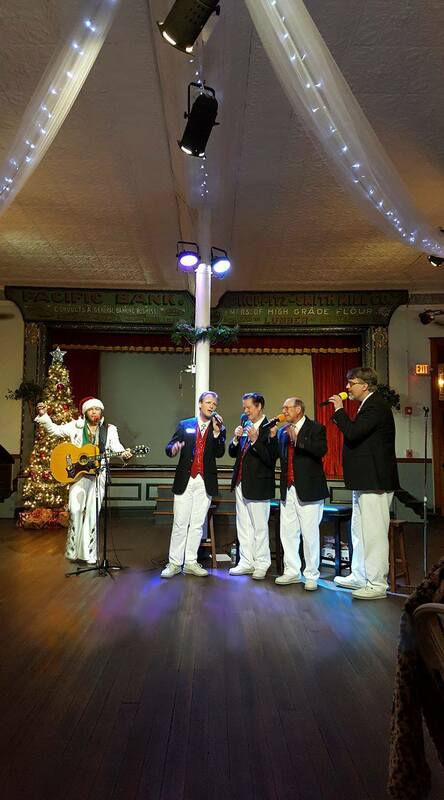 The quartet has been asked to sing in many recreations this year including some in the actual Forest Park buildings dating back to the Fair era. 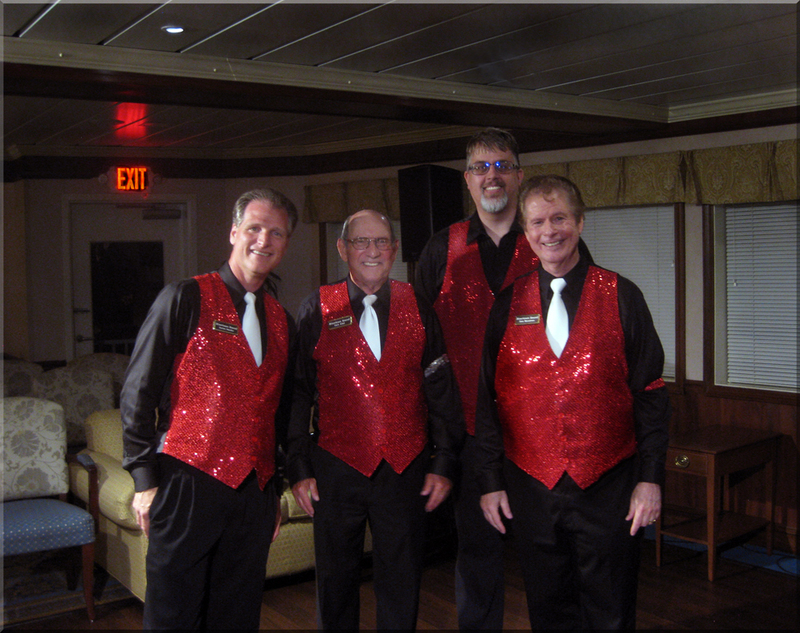 (Missouri Historical Society and Lindell Pavilion) It is a wonderful experience to perform the great barbershop quartet songs from the "turn of the century" including the famous theme song written for the fair in 1904, "Meet Me In St. Louis". If you have an event for Rivertown Sound to sing "Meet Me In St. Louis" (and many others! ), send an email to rivertownsound@yahoo.com. New Barbershop Singer is All Grown Up. 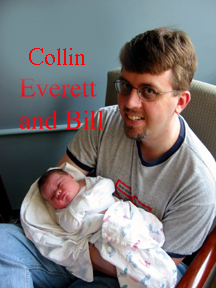 Collin Everett Dean entered the world on Friday, July 9, 2004. 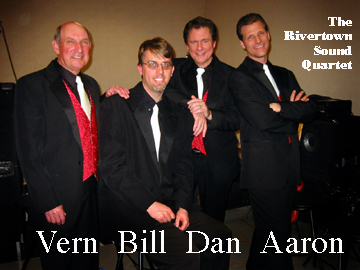 Rivertown Sound tenor Bill Dean cannot decide if Collin Everett will also be a tenor like himself, or sink to the depths of sound like our basses Paul Ogle and Vern Abel. 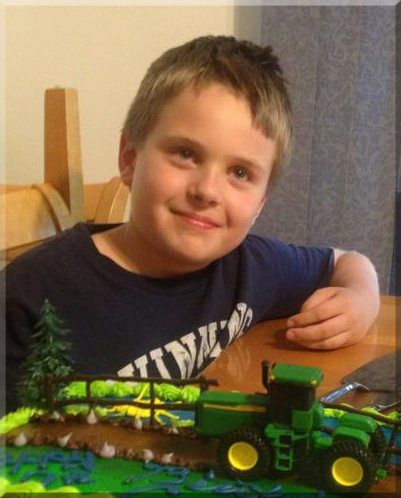 Mother Heather Dean is just happy that Collin is doing well in school and loves to play sports. It has been reported that he has listened to plenty of fine barbershop quartet CD's (including Rivertown Sound, of course). Heather Says "Yes!" In Front of 3000 People! 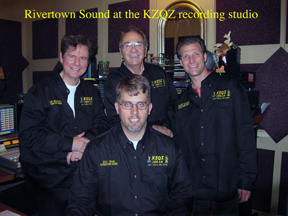 Rivertown Sound Perform on KZQZ 1430 AM Radio! 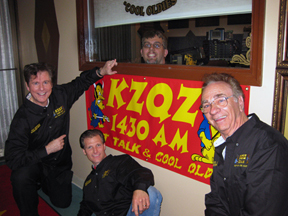 Rivertown Sound enjoyed performing on the new "Cool Oldies" station in St. Louis, KZQZ, 1430 AM. The new radio station has taken St. Louis to the airwaves like a storm. Following the format used by long gone favorite KXOK, it is all oldies, all the time. The era played is 1955 - 1970. The top pop songs, mostly classic Rock and Roll, are played constantly with little interruption. Of course they play the number one hits of the great performers like Elvis and the Beach Boys, but what is so nice is that they play lesser known "hits" by the great stars too. Tom (second from right) with Mark McGwire at a Cardinal's Benefit. During mid-2001, Tom realized he no longer had the time or energy to dedicate to the quartet, and officially retired. Tom was a founding member of the quartet in 1985 when we all decided to create a quartet to perform in the way the old quartets of the turn of the century did: Entertain with any type of songs that an audience wanted to hear. He was the one who contacted all of the theatrical agents in St. Louis and arranged the complex list of shows. 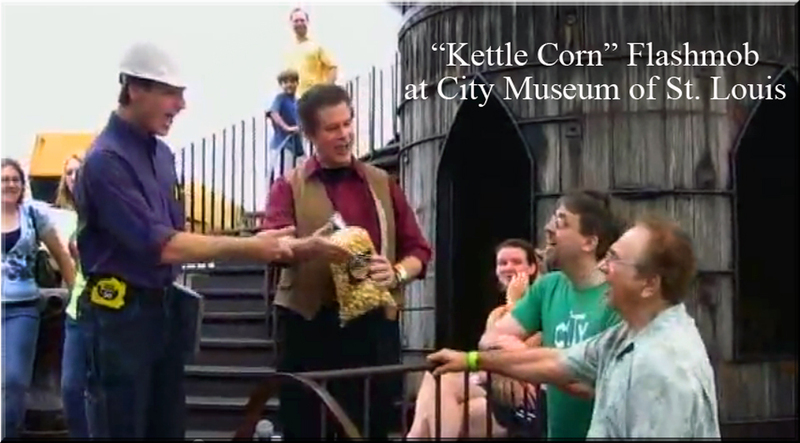 During his hundreds of performances, he met so many people who always complimented his wonderful singing voice. He considers singing the National Anthem before the St. Louis Cardinals game shortly after the Persian Gulf War, as the highlight of his singing career. Later he performed at a Cardinal's benefit which featured Mark McGwire and the team. 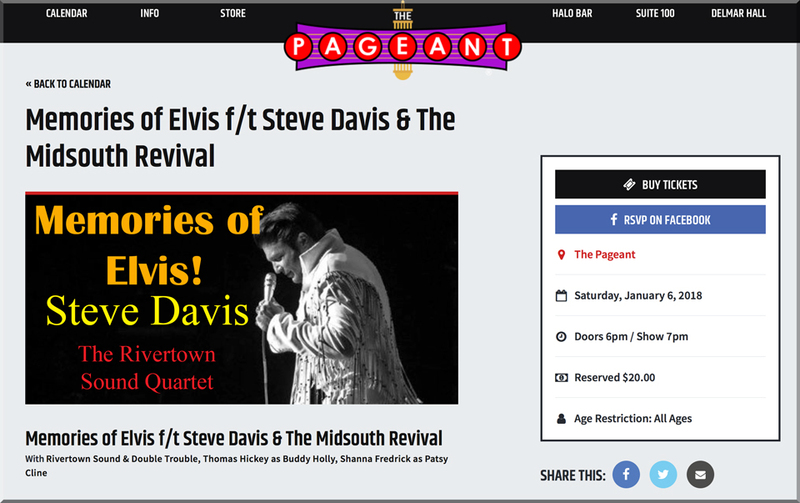 January 7, 2017: Pageant Theater, annual "Memories of Elvis" Birthday Celebration, University City, MO, "Delmar Loop" area. (with Steve Davis) Tickets available to the public (Ticketmaster) - In the fall of '16, call early because this spectacular annual event will sell out quickly. Friendship 7, 2017: Winter show for Friendship Village residents. Gravois and Hwy 270. St. Louis, MO. With The St. Louis #1 Chapter Chorus. Open to residents and guests. February 19, 2017: Special show to honor the memory of the great St. Louis barbershopper, John Walsh. Bevo Mill. St. Louis, MO. Private event. February 23, 2017: Special winter show for our friends at Regina Cleri. St. Louis. Private Event. March 11, 2017: 80th Birthday Celebration for Maureen. Private Event. March 15, 2017: St. Lukes United Methodist Church. 2761 Telegraph road. St. Louis, MO. Lenten Reflection & St. Patrick's Concert. Open to church members and guests. Corned Beef Dinner available. May 3, 2017: Special 80th Birthday Celebration. Private Event. May 13, 2017: Annual "Springtime Parade of Harmony Show". With The St. Louis #1 Chapter Chorus. Knights of Columbus Hall, Desoto, MO. 7:00 pm. Open to public. $15.00. General Admission. May 20, 2017: Washington University Alumni Luncheon. 11:00-1:30 pm. Private event. June 6, 2017: Summer show for Friendship Village residents. Gravois and Hwy 270. St. Louis, MO. With The St. Louis #1 Chapter Chorus. Open to residents and guests. June 25, 2017: Summer show for Friendship Village Fountain View residents. Gravois and Hwy 270. St. Louis, MO. [This show is by Rivertown Sound only.] Open to residents and guests. June 30 2017: "Lost In The 50's" all acapella performance in the famed "Opera House" of Pacific Missouri. 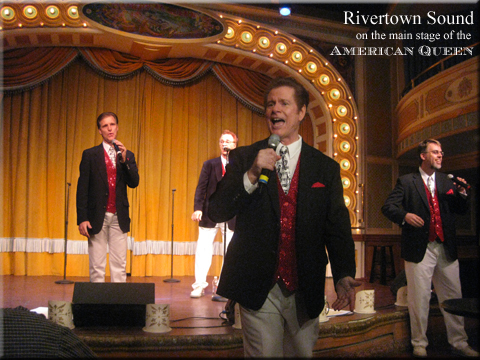 This special show in the century old vaudeville theater features The Rivertown Sound for a full two act performance! Tickets are $25 which includes free Coke and pizza -- with two hours of the best of Doo Wop era songs. There will be a cash bar too. Contact The Pacific Opera House for ticket information. July 18, 2017: The MUNY, Forest Park, St. Louis. 7:00 - 7:45pm. With The St. Louis #1 Chapter Chorus. This "pre-show" performance will be before "All Shook Up" show. Free. July 28, 2017: Join us for an old fashioned Gospel Music Festival. Main Street United Methodist Church, 1400 Main Street, Alton, Illinois, "Pietown Gospel Musicfest" 7:30 - 9:00 pm. (with Steve Davis). We are joining Steve to perform the best in gospel, sacred, and inspirational music. 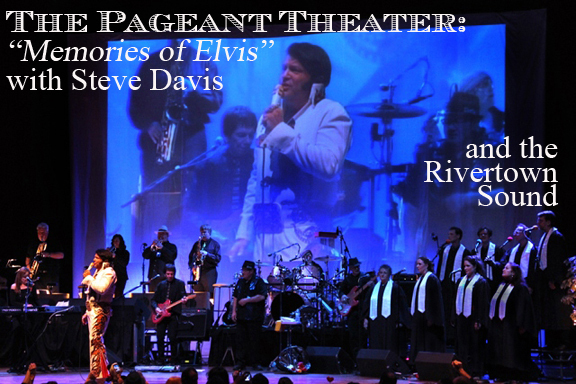 No Elivs Presley this time, just Steve's amazing singing -- with Rivertown Sound performing their favorite songs too! This unique event is open to the public and is free. July 29, 2017: "Sunshine Gala" benefit sponsored by The Fransciscan Sisters of Our Lady of Perpetual Help. Our Lady of the Snows Shrine in Belleville, Illinois. 7:30 - 8:00pm. Open to the public. August 12, 2017: "Barbershop Harmony in the Park". With The St. Louis #1 Chapter Chorus. Hillsboro City Park, Old Hwy 21. 6:30 - 7:30 pm. Open to public. Free. Food and beverage from "Samwich Shop" wagon will be available. August 19, 2016: St. Louis Area Barbershop Festival. St. Paul's Evangelical Church, 9801 Olive Blvd, St. Louis, MO. 1:00 pm. Almost all the men and women barbershop choruses and quartets of metro St. Louis gather once a year to perform for each other. $10.00. Open to the public. August 25, 2017: Queen of the Mississippi Steamboat. Under the Gateway Arch, St. Louis, MO. Open to passengers only. September 5, 2017: "Guest Night" with The St. Louis #1 Chapter Chorus. Jefferson Community College Open to guests of members of the chorus. September 24, 2017: 150h Anniversary of the Carondelet Baptist Church. 7301Virginia Avenue, St. Louis City, MO 63111. With The St. Louis #1 Chapter Chorus. Open to everyone! November 11, 2017: Aaron will be the MC for the show! NO Rivertown Sound this time around. So, come out to see our new actor make his debut! Annual show of the Waterloo Chapter of the Barbershop Harmony Society (The Kaskaskia Trails Chorus). Turner Hall, 211 East Cherry Street, Columbia, Illinois. 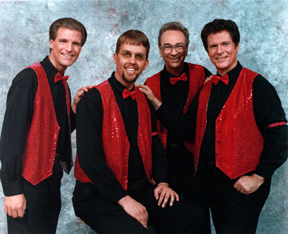 International Champion Quartet, Storm Front, will be the special guests! Open to the public. November 18, 2017: The Blue Owl Restaurant, and the shops of Kimmswick, MO. 2:30 - 8:30pm. Christmas Tree Lighting Ceremony and candlelight walk. Free and open to the public. We try to visit every one of the 25+ shops and sing a song. It's total fun. Join us. See the town lit up with candles and sparkling lights. It's magic! November 30, 2017: Holiday Party for Mueller Prost in Clayton. Private Event. December 2, 2017: Annual Christmas Show. With The St. Louis #1 Chapter Chorus. Jefferson Community College Open to public. Tickets: $15.00. 2:00 - 4:00pm. This annual tradition sells out quickly. Get tickets in November, 2017, on the chorus Stl1.org web site. December 3, 2017: The Blue Owl Restaurant, and the many shops of Kimmswick, MO. 11:30 - 2:30pm. Kimmswick, MO. Christmas Cookie Walk. December 3, 2017: Front & Market Gifts of Kimmswick, MO. 2:30 - 4:30pm. Special performances of holiday songs for the entire time. Stop by and say "hi" and suggest a song! December 8, 2017: Jefferson College Friday Speaker Series: Barbershop Holiday Performance. Student Center. 11:30 - 12:30pm. Open to the public: $7.00 - includes buffet lunch! Be sure to contact Lisa at lvinyard@jeffco.edu to be sure they put out some extra food for you. December 9, 2017: The Blue Owl Restaurant, Kimmswick, MO. Christmas Lunch. 11:00 - 2:00pm. Reservations recommended. December 10 , 2017: Immaculate Conception Catholic Church, Arnold, MO. Christmas Meeting of the Senior Group. 5:00pm. Open to parish members. December 16, 2017: The Blue Owl Restaurant, Kimmswick, MO. 9:00 am. Breakfast with Santa! Reservations recommended. Bring the kids and the whole family! We just love this annual joyous event! December 17, 2017: The Blue Owl Restaurant, Kimmswick, MO. Chistmas Lunch! For the whole family! 11:30 - 2:00. Reservations recommended. December 19, 2017: A Christmas Show with The St. Louis #1 Chapter Chorus. Details are being discussed. December 20, 2017: A Christmas Luncheon, 11:45 - 12:45, for the folks at Empire Comfort Systems, 918 Freeburg Ave., Belleville Illinois 62220. Private event. January 6, 2018: Pageant Theater, annual "Memories of Elvis" Birthday Celebration, University City, MO, "Delmar Loop" area. (with Steve Davis). Showtime: 7:00pm. $20 Tickets available to the public (Through Ticketmaster) - In the fall of '17, call early because this spectacular annual event will sell out quickly. January 20, 2018: A special "1904 St. Louis World's Fair" themed Gala for Anderson Hospital of Maryville, Illinois. Four Season Hotel Banquet Room, St. Louis. Open to ticket holders. February 27, 2018: Our Lady of Life Apartments, 7655 Watson Road, St. Louis, MO 63119. A Late Winter Barbershop Harmony Show with The St. Louis #1 Chapter Chorus. Open to residents and guests. March 14, 2018: St. Luke's United Methodist Church. 2761 Telegraph road. St. Louis, MO. Lenten Reflection & St. Patrick's Concert. Open to church members and guests. Corned Beef Dinner available. April 7, 2018: An old time "Vaudeville Show!" Presented on an ACTUAL vaudeville stage from 1908. The Pacific Opera House will present this special show featuring The St. Louis #1 Chapter Chorus and The Rivertown Sound Quartet. Tickets will be available from the Opera House in late February. April 23, 2018: Magnolia Terrace, Waterloo, Illinois. Spring Celebration. Open to residents and their families. May 5, 2018: Annual "Springtime Parade of Harmony Show". With The St. Louis #1 Chapter Chorus. Knights of Columbus Hall, Desoto, MO. 7:00 pm. Open to public. $15.00. General Admission. May 19, 2018: Washington University Alumni Luncheon. 11:00-1:30 pm. Private event. May 28, 2018: Memorial Day Commemoration. Desoto, Missouri. Open to the public. June 16, 2018: Queen of the Mississippi Steamboat. Under the Gateway Arch, St. Louis, MO. Open to passengers only. June 24, 2018: "Fountain View" Retirement Home, Friendship Village. 5:30 - 6:30pm. Open to residents and guests. July 6, 2018: Queen of the Mississippi Steamboat. Under the Gateway Arch, St. Louis, MO. Open to passengers only. High water has forced this to be re-scheduled. July 10, 2018: The MUNY, Forest Park, St. Louis. 7:00 - 7:45pm. With The St. Louis #1 Chapter Chorus. This "pre-show" performance will be before "The Jersey Boys" show. Free. July 13, 2018: Happy Birthday Event! Bellerive Country Club, Ladue, MO. Private. July 17, 2018: "In The Good Old Summertime" concert. Villa Rose Retirement Facility, 401 S. Moreland, Bethalto, IL. Open to residents and their guests. August 4, 2018: "Barbershop Harmony in the Park". With The St. Louis #1 Chapter Chorus. Hillsboro City Park, Old Hwy 21. 6:30 - 7:30 pm. Open to public. Free. Food and beverage from "Samwich Shop" wagon will be available. August 15, 2018: Queen of the Mississippi Steamboat. Under the Gateway Arch, St. Louis, MO. Open to passengers only. August 18, 2018: St. Louis Area Barbershop Festival. St. Paul's Evangelical Church, 9801 Olive Blvd, St. Louis, MO. 1:00 pm. Almost all the men and women barbershop choruses and quartets of metro St. Louis gather once a year to perform for each other. $10.00. Open to the public. August 17, 2018: "Memories of Elvis" with Steve Davis and his band. Andre's American West Banquet Hall. 8:00pm. Open to the public. Call the hall for tickets. August 25, 2018: "Sunshine Gala" benefit sponsored by The Fransciscan Sisters of Our Lady of Perpetual Help. Our Lady of the Snows Shrine in Belleville, Illinois. 7:30 - 8:00pm. Open to the public. 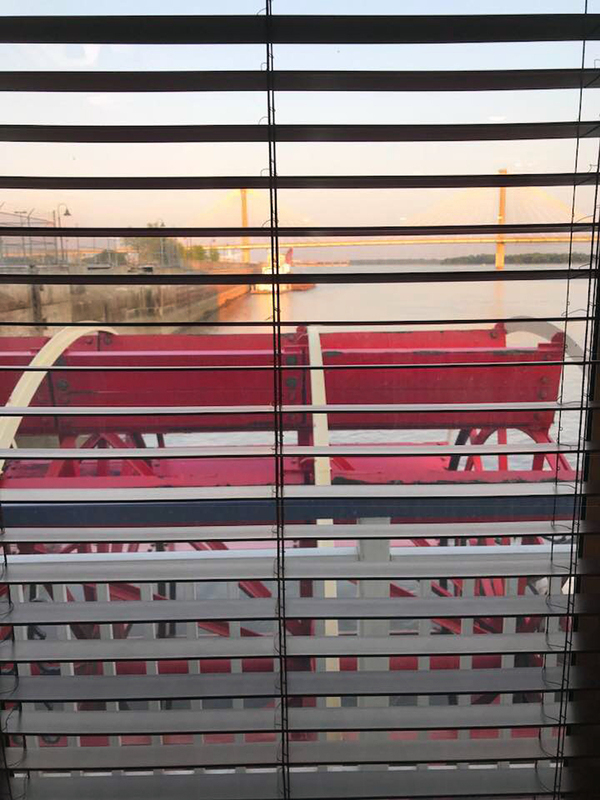 September 14, 2018: Queen of the Mississippi Steamboat. Under the Gateway Arch, St. Louis, MO. Open to passengers only. MOVED to Quincy Illinois! Long drive, but lots of fun for us. 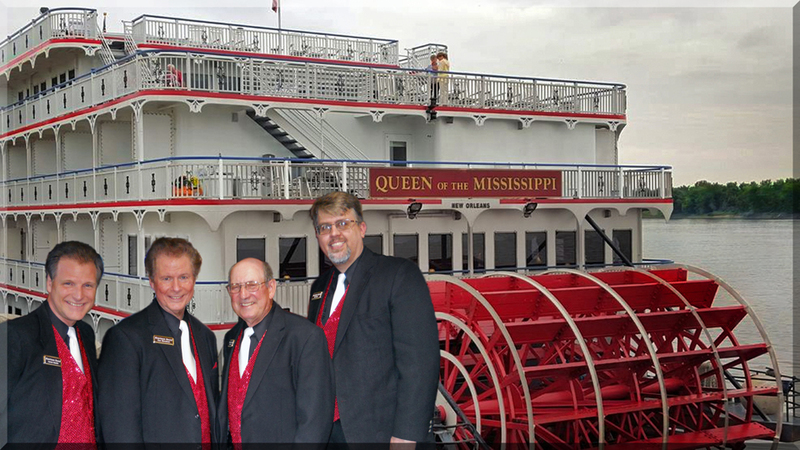 September 19 - 20, 2018: Queen of the Mississippi Steamboat. Cruise from Cape Girardeau to Chester, Missouri. Open to passengers only. CANCELLED because of high water. September 23, 2018: City Sunset Park "Fall Harmony". Festus, Missouri. 6:00 - 8:00pm. Open to the public. Free. Bring chairs, blankets, and your own food/drinks. October 7, 2018: Special performance for the Ladies Auxiliary. Knights of Columbus Hall, Desoto, MO. 12:30 pm. Open to members and guests. October 12 - 13, 2018: Central States Barbershop Convention, St. Charles Convention Center. 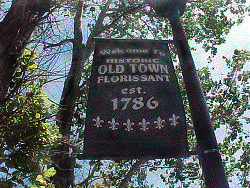 St. Charles, Missouri. Open to public. Tickets available for convention on the Central States web site. November 13, 2018: Our Lady Catholic Church, 1550 St. Mary Lane, Festus, Missouri. Senior Citizens Club. Around 6:00 pm. Open to parish members. November 15, 2018: Dedication of the new Trolley Line in the Delmar Loop! Joe Edwards, MC. 10:00am. CANCELLED because of heavy snow! November 17, 2018: The Blue Owl Restaurant, and the shops of Kimmswick, MO. 2:30 - 8:30pm. Christmas Tree Lighting Ceremony and candlelight walk. Free and open to the public. We try to visit every one of the 25+ shops and sing a song. It's total fun. Join us. See the town lit up with candles and sparkling lights. It's magic! December 1, 2018: Annual Christmas Show. With The St. Louis #1 Chapter Chorus. Jefferson Community College Open to public. Tickets: $15.00. 2:00 - 4:00pm. This annual tradition sells out quickly. Get tickets in late October, 2018, on the chorus Stl1.org web site. December 2, 2018: the many shops of Kimmswick, MO. 11:30 - 3:00pm. Kimmswick, MO. Christmas Cookie Walk. December 4, 2018: St. Francis of Assisi Senior Club Christmas Dinner. Andre's Banquet Center. Open to members only. 7:00pm. December 8, 2018: Shops of Kimmswick, MO. 11:30 - 2:30pm. Special performances of holiday songs for the entire time. Stop by and say "hi" and suggest a song! December 15, 2018: The Blue Owl Restaurant, Kimmswick, MO. 9:00 - 11:00am. Breakfast with Santa! Reservations recommended. Bring the kids and the whole family! We just love this annual joyous event! December 15, 2018: The Shops of Kimmswick, MO. Christmas Lunch. 12:00 - 3:00pm. December 16, 2018: The shops of Kimmswick, MO. Chistmas Shopping Fun! Ride the horse drawn carriage. For the whole family! 11:30 - 3:00pm. December 18, 2018: A Special Christmas Show with The St. Louis #1 Chapter Chorus. Our Lady of Life Senior Center. Shrewsbury, MO. Private event. February 2, 2019: 80th Birthday Party for six special friends. St. Louis. Private Event. March 9, 2019: Big party. St. Louis. Strictly private Event. 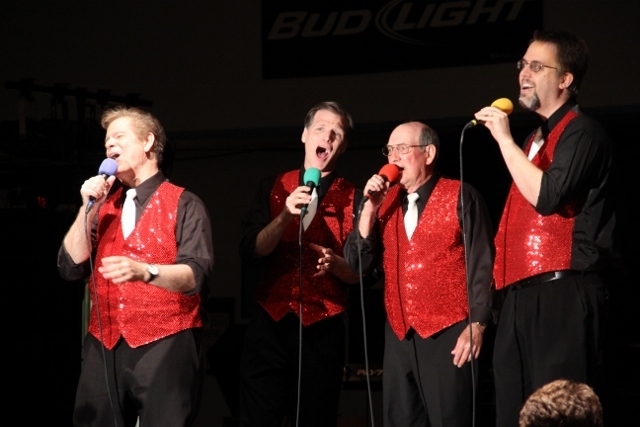 April 27, 2019: Annual Spring Show: "Main Street Parade of Barbershop Quartet Harmony". With The St. Louis #1 Chapter Chorus. Knights of Columbus Hall, Desoto, MO. 7:00 pm. Open to public. $15.00. General Admission, but tables can be reserved. Wonderful hot food is available before the show. Plenty of beverages at the bar. June 1, 2019: Wedding Reception at a very special St. Louis location. Strictly private event. June 11, 2019: The MUNY, Forest Park, St. Louis. 7:00 - 7:45pm. With The St. Louis #1 Chapter Chorus. This "pre-show" performance will be before "Guys and Dolls" show. Free. July - September, 2019: Queen of the Mississippi Steamboat. Under the Gateway Arch, St. Louis, MO. Open to passengers only. Several shows that will be confirmed based on river conditions. August 2, 2019: "Memories of Elvis" with Steve Davis and his band. Andre's American West Banquet Hall. 8:00pm. Open to the public. Call the hall for tickets. 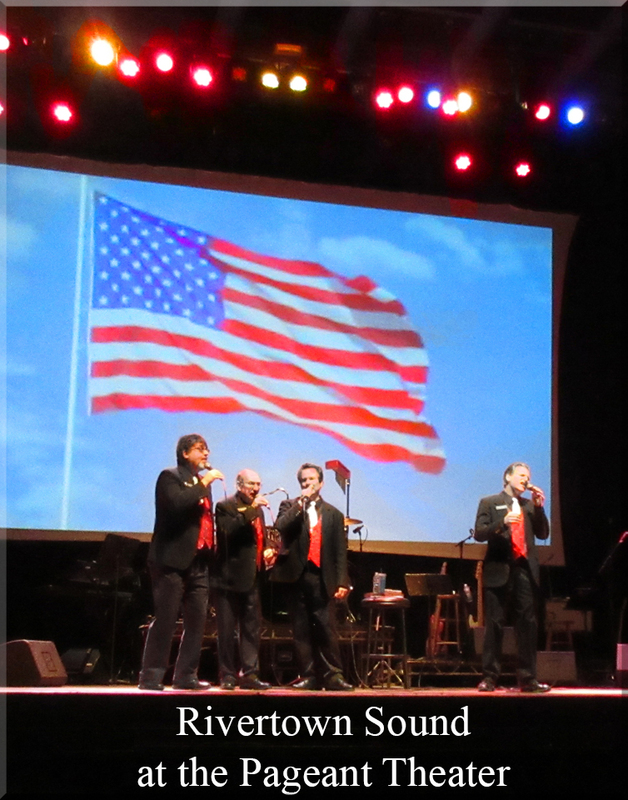 September 14, 2019: "Barbershop Harmony in the Park". With The St. Louis #1 Chapter Chorus. Hillsboro City Park, Old Hwy 21. 6:30 - 7:30 pm. Food and beverage from "Samich Shop" wagon will be available. Open to public. Bring a lawn chair or blanket. Free. September 22, 2019: City Sunset Park "Fall Harmony". Festus, Missouri. 6:00 - 8:00pm. Open to the public. Free. Bring chairs, blankets, and your own food/drinks. THIS SHOW HAS NOT YET BEEN CONFIRMED. October 2, 2019: "Fountain View" Retirement Home, Friendship Village. 5:30 - 6:30pm. Open to residents and guests. November 12, 2019: Our Lady Catholic Church, 1550 St. Mary Lane, Festus, Missouri. Senior Citizens Club. Around 6:00 pm. Open to parish members. November 17, 2019: The Blue Owl Restaurant, and the shops of Kimmswick, MO. 2:30 - 8:30pm. Christmas Tree Lighting Ceremony and candlelight walk. Free and open to the public. We try to visit every one of the 25+ shops and sing a song. It's total fun. Join us. See the town lit up with candles and sparkling lights. It's magic! THIS SHOW HAS NOT YET BEEN CONFIRMED. December 7, 2019: Annual Christmas Show. With The St. Louis #1 Chapter Chorus. Jefferson Community College Open to public. Tickets: $15.00. 2:00 - 4:00pm. This annual tradition sells out quickly. Get tickets in late October, 2018, on the chorus Stl1.org web site. December 8, 2019: The many shops of Kimmswick, MO. 11:30 - 3:00pm. Kimmswick, MO. Christmas Cookie Walk. THIS SHOW HAS NOT YET BEEN CONFIRMED. December14, 2019: Shops of Kimmswick, MO. 11:30 - 2:30pm. Special performances of holiday songs for the entire time. Stop by and say "hi" and suggest a song! THIS SHOW HAS NOT YET BEEN CONFIRMED. 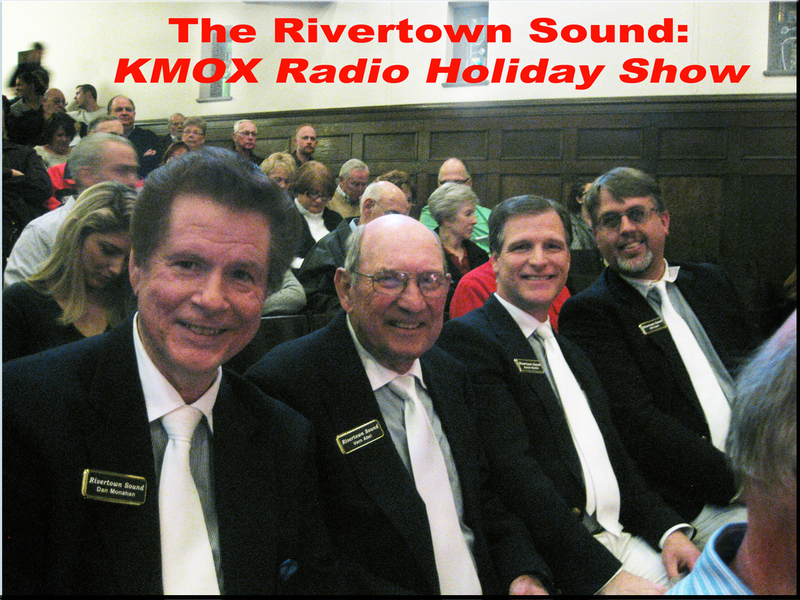 December 17, 2019: A Special Christmas Show with The St. Louis #1 Chapter Chorus. Our Lady of Life Senior Center. Shrewsbury, MO. Private event. THIS SHOW HAS NOT YET BEEN CONFIRMED. December 21, 2019: The Blue Owl Restaurant, Kimmswick, MO. 9:00 - 11:00am. Breakfast with Santa! Reservations recommended. Bring the kids and the whole family! We just love this annual joyous event! THIS SHOW HAS NOT YET BEEN CONFIRMED. December 21, 2019: The Shops of Kimmswick, MO. Christmas Lunch. 12:00 - 3:00pm. THIS SHOW HAS NOT YET BEEN CONFIRMED. December 22, 2019: The shops of Kimmswick, MO. Chistmas Shopping Fun! Ride the horse drawn carriage. For the whole family! 11:30 - 3:00pm. THIS SHOW HAS NOT YET BEEN CONFIRMED. How Do We Plan Our Performances? We take pride in our ability to sing a wide variety of songs. Our scores of tunes range from the turn - of - the - century Barbershop Classics, through the Big Band era, the "Doo-Wop 1950's", and then to a touch of the "modern". Click HERE to read how we plan our performances, and to see another picture. The St. Louis #1 Chapter "Spirit of St. Louis Chorus"
The St. Charles "Ambassadors of Harmony Chorus" International Barbershop Champion chorus! St. Louis Harmony Chorus: Champion Sweet Adeline Chorus centered in Kirkwood, Missouri. 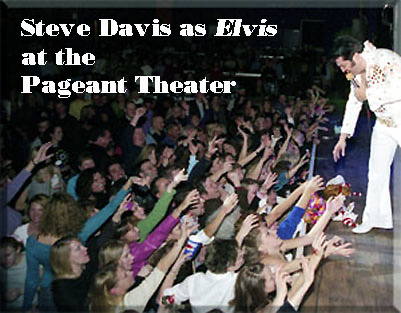 Steve Davis "Memories of Elvis": the Midwest's best tribute to Elvis Presley! Ravaged Hearts: Royal Robbins and Ray Schulte, from Steve Davis' band, Mid South Revival, have their own creative, musical group. Pavlov's Dog: famed St. Louis based rock band, co-founded by Mike Saffron, who is the drummer for Steve Davis' band, Mid South Revival. 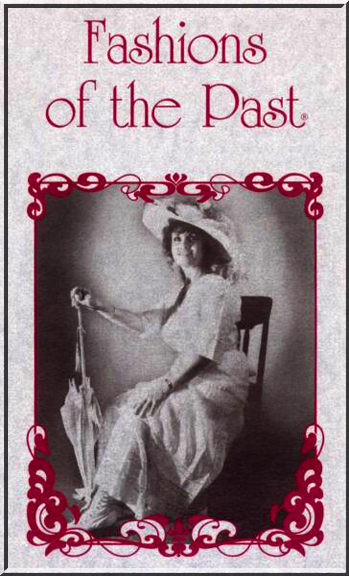 Fashions of the Past - Our friend Carol Ann Miller can set up a "1904 fashion show" for you and your party guests. Complete with all the "turn of the century fun!"